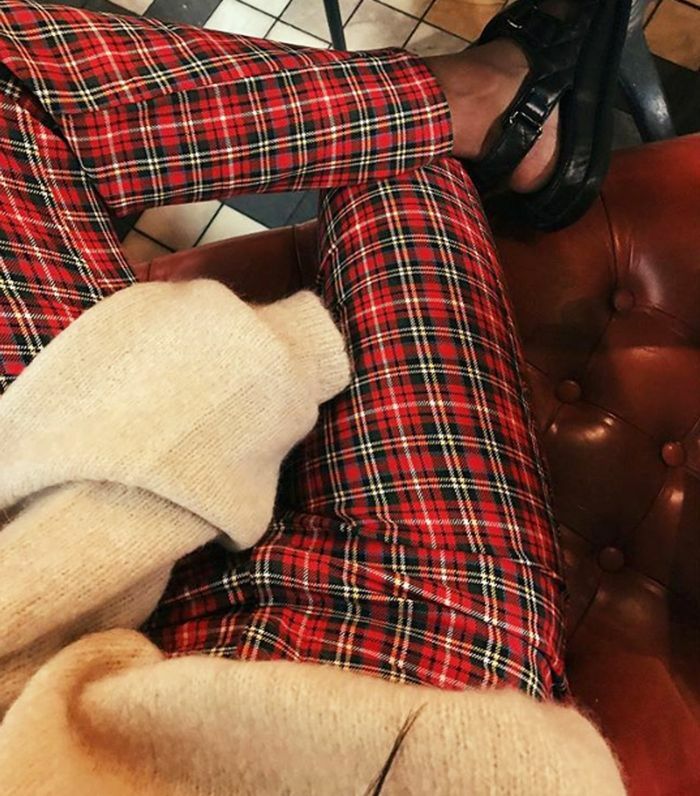 It doesn't take a genius to see the vast amount of tartan-centric street style looks currently parading over on Instagram. This pattern trend is a great continuation of the past year's checked-blazer popularity, and we're always grateful for a look developing and lasting rather than spiking and tailing off. It's the season where that Burberry plaid trench is definitely worth pulling out from the back of the wardrobe. This most exciting 2018 update for this trend is the overwhelming amount of vibrant tartans, plaids and checks coming through. From fluoro greens and bright blues to traffic-stopping yellow, this season's tartan is available in iterations for the brave and for the fashion-shy. And of course, you should still expect to still see traditional shades of red, navy and green—all of which can be found on straight-leg trousers and classic jackets. From coats to skirts (and just about everything in-between), many new-in items have been given a generous covering of tartan. However, there are five key items that do it best, and the ways to wear them might surprise you. Scroll down to find out and shop from our edit of this year's big tartan fashion trend. Style Notes: A pair of tartan trousers is the most accessible way to tap into this print trend and get it right. Straight legs are great with a pair of ankle boots whilst wide-leg pants look super cool with all-white sneakers. Pair with a cosy cashmere knit like Monikh and you've got an instant blogger-approved look. Style Notes: Nothing say's "fashion girl" from fifty paces quite like the original Burberry trench. The British heritage tartan print has been a fail-safe since 1879 (yes, really! ), and it's still just as coveted today. Other brands have also taken on and reworked the tartan trench this season, as well as introducing other outerwear styles in this classic check. We suggest styling these with dark-wash denim and heavy-duty combat boots. Style Notes: Nope, it isn't a false alarm. Tartan kilts are really back this season. From those worthy of a spot in Clueless to styles that would fit seamlessly into the Highlands, you have options. Many are as '90s as can be (short in length and in all the standout colours) whilst others are longer and more traditional. Either way, pair one with a great pair of Western boots if you really want the 2018 edge. Style Notes: Tartan is so popular that even the minimalists are incorporating the pattern into their wardrobe. Stay subtle and opt for a beige version like Tine, or go all-out in one of this season's neon options from House of Holland or Uterqüe. Style Notes: Tartan dresses are surprisingly big news for winter, and they come in just about every style: pinafores, midi dresses, long-sleeved wraps and, of course, standout minis. They're the perfect way to spin your party look into winter. Next up, 13 Instagram-approved winter outfits you can wear on repeat.